Along with many other parks and reserves in the ACT, the 3D imagery of Google "Street View" is now available for a number of tracks and viewing points in the Pinnacle Nature Reserve. The images were captured in 2016 and made available on Google Maps in March 2018. There are several ways to access the imagery but the quickest is to click: The Pinnacle Nature Reserve Track View; this takes you to a panoramic view from the top of The Pinnacle. At the bottom left of the page you will see a little box with the familiar Google "pegman" street view icon in the centre. If you click on the "expand" icon in the bottom left of that box a map view of the area around The Pinnacle will open up across the bottom of your screen. Scrolling around this map you will see the tracks for which the imagery is available as blue lines and viewing points as open blue circles. The full map of these is shown below. Alternatively, just open up Google Maps and search for or scroll to "The Pinnacle". If you then click on the "pegman" street view icon in the bottom right of screen the tracks and viewing points for which imagery is available will be shown as blue lines and open circles, as shown in the map below. Once you have the blue tracks and blue circles showing on the map, click the point you want to view or drag the "pegman" to that point. To exit street view mode, click the back arrow in the inset grey box that will have appeared at the top left of the screen. See below for more information on using street view. Enjoy your virtual walk around the Pinnacle Nature Reserve. 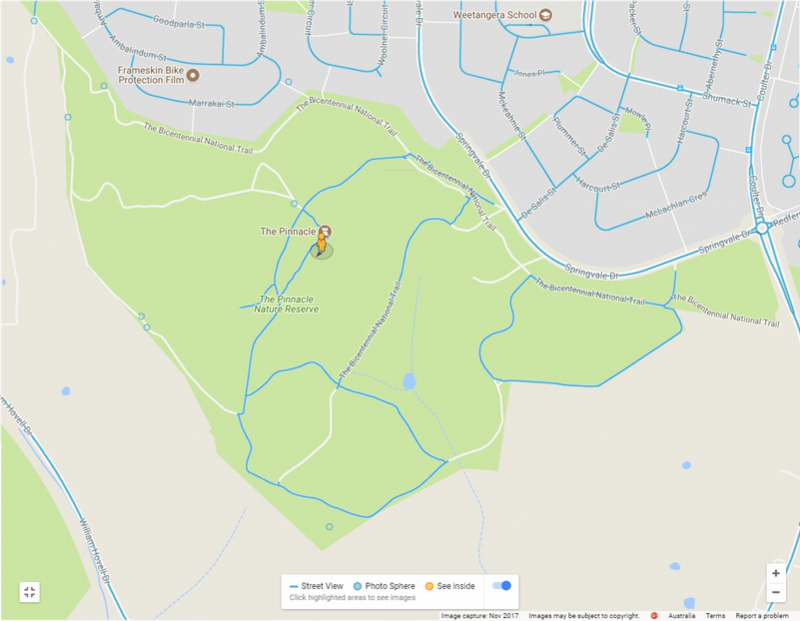 For more information and a list of other areas of the ACT Reserves and Parks where Google street view is available, see Google Trekker in the ACT. To move around, hover your cursor in the direction you want to go. Your cursor becomes an arrow that shows which direction you're moving. To zoom in or out, scroll with your mouse or two-finger zoom with a touchpad. You can also use +and -below the compass. To jump between streets, go to the "Back to Map" window in the bottom left and click the blue highlighted routes.